Trash cans are among the items we most often use in our kitchens, so they must be strong, durable, easy to use and occupy a minimal amount of space. mounted trash cans (or pull-out waste containers). It’s best to place this kind of trash can in open places in your kitchen to reach them easily. If you don’t have enough space, there are trash cans whose design allows you to stick them to the wall, thus saving space. Some of trash can lids open inwards, which is good if you want to put your trash can in a covered place, such as under the sink, where it is not feasible to put a trash can with a lid that opens upwards. Other free-standing trash cans have a foot pedal for quick and easy hand-free opening. A third type of free-standing trash can even has a built-in sensor chip, by means of which the lid will open automatically when your arm approaches and will close when you take your arm away. Some trash cans don’t have a lid. With these, it is easy to deposit garbage, but you run a great risk of attracting unwanted insects. However, if you often put your garbage out without leaving it to stand for a long time and don’t worry that it will be visible, a trash can without a lid is no problem. Free-standing trash cans are available in various colors, shapes and finishes, and you may use the availability of different styles to add value to the kitchen decor. For example, a glossy stainless steel trash can is very convenient if you have furnished your kitchen in a contemporary style. For the casual look, there are other styles of trash can, including baskets made of woven straw. 1. A good trash can will open wide at the top, so that you can throw in a large amount of garbage, such as a full dustpan, at one time. This is not a feature of trash cans whose lids open inwards. 2. If the lid is an integral part of the trash can, you will want to be able to leave it open until you decide to close it, so that you can use it over a period of time without having to keep opening the lid. The lid must move smoothly, open and close quietly, and close firmly to prevent odors. The last refers to all trash cans with lids. 3. If the trash can has a pedal to open the lid, it has to have a rough surface to stop it from slipping when you step on it and it has to be fairly wide so that you can step on it easily from different angles. 4. It is a good idea for the trash can to have a handle, so that you can move it easily. The inner liner (if there are any available), must also have a kind of a handle so that you can take it out and empty it easily. 5. It is a good idea for the trash can to have a rubber bottom or something similar, both for stability and to prevent it from damaging the floor. 6. If you have pets in the house, it’s a good idea to look for a trash can with a lid that can be locked to prevent spillage in case the pets overturn it. These trash cans are most often containers, mounted either in the cabinet under the sink, or in other cabinets in the kitchen. When you open the door of the corresponding cabinet, the container slides out on guides and some containers have a lid that opens automatically. With this kind of trash cans you will save space and given the fact that they remain out of sight, you won’t need to bother about what they look like. You may have a container with several compartments in which you can put different kinds of garbage. For example, you might put the main garbage in one compartment, paper in a second and plastic in a third. 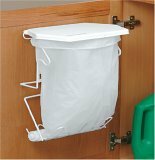 Another type of mounted kitchen trash can just consists of a wire frame with a lid, which may be used with grocery or continuous roll bags. This variant is simple, economical and practical. 1. The trash can you choose will depend mostly on the available space in your kitchen and the amount of garbage you have. Nevertheless, for, say, a family of four, an 11-gallon (50 l) trash can would be more convenient than a 7-gallon trash can (32 l), which would be good for a family of two. the trash can must be tapered, with its upper part being wider, to prevent a vacuum from forming when taking out a full garbage bag. Some kitchen trash cans have holes in their inner liner to prevent such a vacuum. the trash can must have a smooth inner surface, so that there are no edges or mechanical parts to prevent the garbage bag from catching and tearing when it is removed. the bottom of the trash can must be tightly sealed to prevent dirt from spilling out of the trash can, in case the garbage bag spills. the garbage bag must be fixed securely to the upper part of the trash can to prevent it from slipping off and spilling the litter when it is full. Metal trash cans are strong, durable, stable and won’t retain odors, as may happen with a plastic trash can. In addition, they are very easy to clean, especially if they are made of stainless steel. 4. If you want to put the trash can under the sink, make sure the place is usually dry because if it is wet, there will be a mess if garbage spills from the trash can. 5. The trash can must be fire-resistant. 6. The inner liner (if any are available) must be treated with an antibacterial substance. 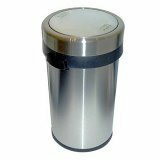 Click here for the best deals on kitchen trash cans. I would like someone to comment on the fact that even though we are paying a premium for stainless steel garbage cans, that the step on type are still using a plastic based mechanism which breaks long before the stainless steel is useless. Replacement parts are of course hard to find in our disposable world. I feel like a bad consumer throwing out perfectly good and expensive stainless steel, but what can I do? If the plastic mechanism is broken, I can’t work the lid anymore and the bin is useless to me. It seems to me to be irresponsible of the manufacturers to produce this kind of waste. I have been searching to buy the wire frame, with lid and trash bag item, screwed on the inside of a kitchen cupboard door. I had one in a previous apartment and found it ideal in an apartment with a tiny kitchen. However, I cannot find anyone who sells them. Actually, hardly anyone even understands what I mean when I ask. Where can I purchase this?